As promised, here are some quick designs I did to test out how well the Layla Mirror Effects stamp with. 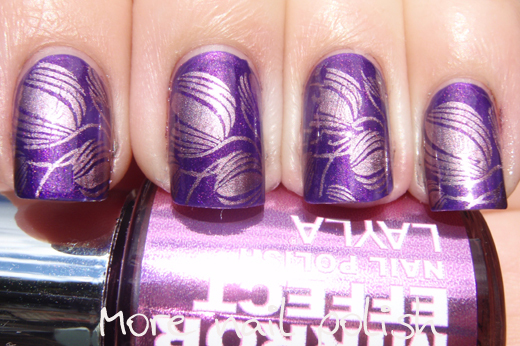 This is Purple Diva, stamped over Ulta3 Orchid. This is Black as Ebony on all fingers, then double stamped with Metal Chrome on the ring finger, over Joe Fresh Gunmetal. Finally, this is Titanium Sky stamped over Cult Nails Time Traveler. So... They look good right. 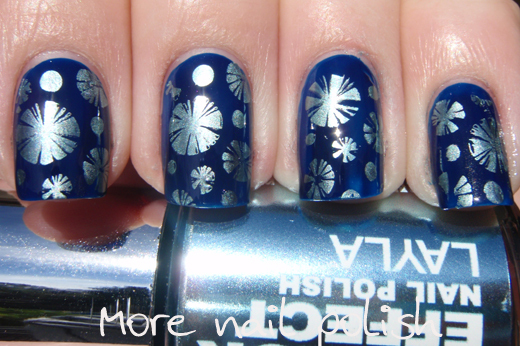 But let me say they are not easy to work with for stamping. You have to work fast, really fast. 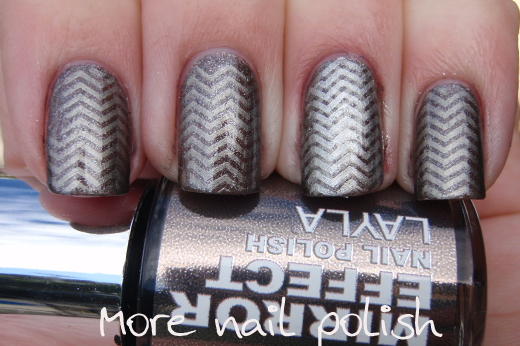 Much faster than I have ever had to work with other stamping polishes before. You have to swipe and pick it up immediately. 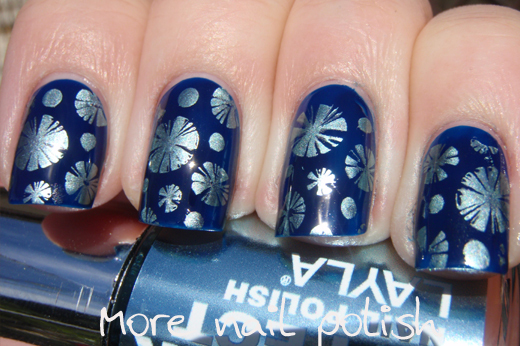 In the beginning I didn't think they were going to work for stamping at all, cause I just couldn't pick up the design (and I've never had that problem before). So try to hold the stamper in your other hand, so that as soon as you swipe, you can pick it up. 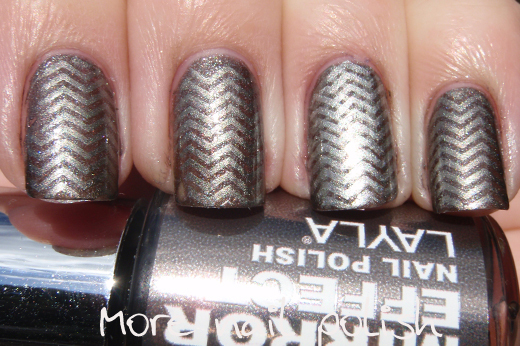 But, once you have picked up the design on the stamper, don't stamp it down straight away otherwise it stamps down wet and doesn't dry to a shiny chrome finish. I found that if I waited about 10 seconds for it to dry a bit, then stamp it down, I got the best effect. Ok, you convinced me. I need mirror Effect! Beautiful! Was really amazed with the swatches in your previous two posts due to the lack of brush strokes! The last one is my favorite, but they all look fantastic. Thanks for the tips too. These look so awesome! Thanks for working so hard on this! These are so pretty!!! Love the stamps you chose! Thanks for the tips - they look great! 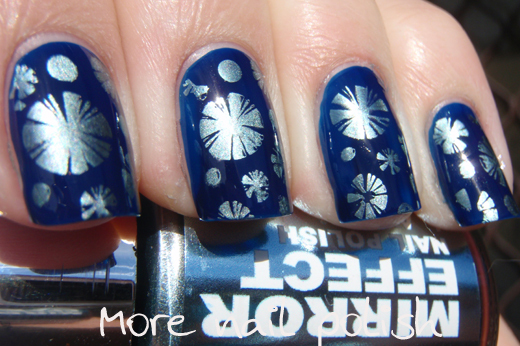 I normally do already hold my stamper in the other hand while I scrape, so I might not have noticed a difference but having to wait for 10 seconds after is something I may not have tried. 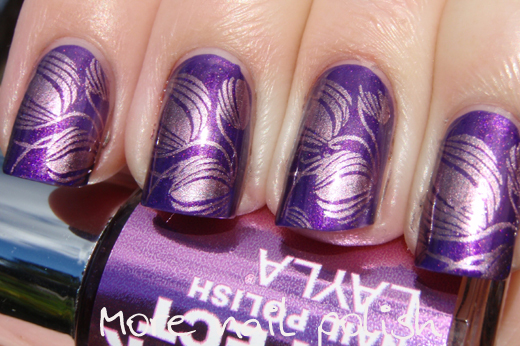 Thank you so much for trying the Layla's for stamping and sharing your findings. I *need* titanium sky and time traveler! Which plate did you use? Love the designs! thank you very much, loved the post!